Deathblow: An Underrated Holiday Classic? It’s the holiday season and all through the house, not a comic was so festive, or even snowy or restive. If that was too complex to get a handle on then allow me to put it straight – the topic we’re delving into now is a little discussion about holiday comics. Or, rather, just one – and that one would be the one that most would never pick out of a line up as being a holiday tale. Yessir, we’re talking about Deathblow! Deathblow – one of the brainchildren of Image/Wildstorm headliner Jim Lee. Let’s not mince words and just get right to the point about saying that, other than WildC.A.T.S., this series was as Jim Lee as one gets. Hell, this is a series that is entrenched in that sort of flavoring. Even including ragtag fan favorite Grifter into the mix at the last second, for good measure, of course and some Gen-13 references. While mainly remembered now for Tim Sale’s early art, which holds up in a variety of places, it had been relegated to the annals of “90’s stuff that we’ll shelve due to being embarrassed”. At least, until the powers that be at DC Comics (okay, let’s just say that it was Jim Lee) decided to bring it out in a brand spankin’ new deluxe edition, which we will be talking about in this lil’ feature right here. So, what makes a series like Deathblow a “must-read” for the Christmas/Holiday season at all? It’s just the story about a generically badass mercenary with some slight regenerative powers. What does that have to do with Christmas? Well, the answer, dear readers, is pretty much nothing at all. Yet, much like the holiday spirit that dozens of TV special like to espouse, doesn’t that say much more than it could? Deathblow is, at heart, is the story of a man who is seeking redemption. Sure there is a lot of “gritty” narration, but it’s just obscuring the already overt narrative of a wounded merc trying to make up for the mistakes he’s made in life. And what way does he find will bring him to that desperately sought after salvation? Well, the arrival of a mysterious “messiah child” and a secretive religious order. So, it’s not like this is a story that doesn’t have some sort of passionate core to it. It’s your standard holiday fable, if you think about it in the most basic of terms. The Scrooge undergoing the metamorphosis. Of course in this case the metamorphosis would be a cold-blooded killer turning into something – not. But the point overall still stands. It also doesn’t hurt that the story has a lot of white to it, reminiscent of snow. I’ll level once more, though, with Deathblow as a holiday story. Sure, my above reasons may not hold up to real scrutiny but it’s a nice excuse to get into the spirit of the holiday season, which is about the beauty that is life. 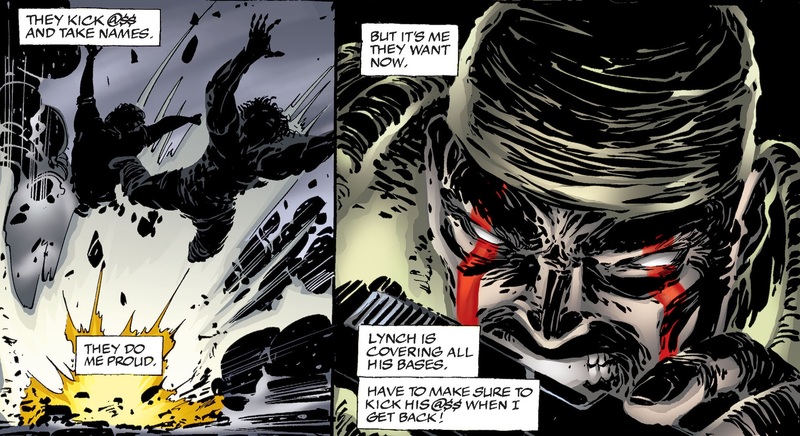 Which brings me to my very next point – the fact that the real main plot of Deathblow is that he’s on a mission to kill what is ostensibly the Angel of Death. Bet that got your attention. If I cannot celebrate Christmas by reading a comic where a muscle bound hulk with a chain gun, who soliloquies in purple prose, teams up with a nun from a hidden sect of the Christian church to stop a demon from resurrecting the Four Horsemen of the Apocalypse – then what would be the point of it at all? I mean, did I forget to mention that they also have to help of a magical holy sword? It’s so Christmas-y that you can almost hear “Joy to the World” play over every page. There’s a definite quality to it that helps it stand out as a “90’s” comic in the best of ways. There’s a lot of action, some nonsensical, and a lot of really shifty art/design choices. Coupled with the repeatedly mentioned narration and faux-grit tone of the whole affair – maybe it could have been forgotten. Yet, it hasn’t. And it’s good that it hasn’t because it allows for the sort of niche-reading that shows like the old Adam West Batman can enjoy. It’s perhaps one of the most recent additions to the ever-increasing “90’s Camp” style. So, maybe, just maybe, that could count as a Christmas miracle for a story that should have been destined for nothing. Oh – and the Holy Grail plays a part too. Happy Holidays dear readers!